Shimla : Himachal Pradesh State Co-operative bank has become the first bank in the country in co-operative sector to launch its own mobile banking (mobile app) and e-portal. 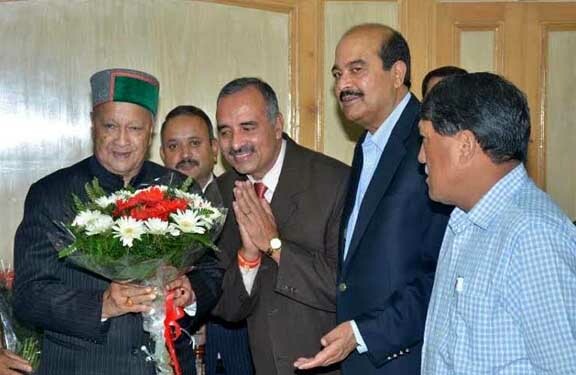 Chief Minister Virbhadra Singh launched the mobile banking application and e-portal of the bank here today. The Chief Minister congratulated the bank officers, particularly its Chairman, Harsh Mahajan for achieving the feat and taking the bank to new heights and appreciated the role of the bank in the State. The Chief Minister said that the customers would be able to use the new technique and would have easy access to bank facilities and internet banking. Besides, it would also help the management to easily communicate with its employees as and when desired. Detailing about the mobile banking and e-portal system Harsh Mahajan said that the mobile banking solution of the bank has been designed with customer centric approach using the security norms as laid down by Reserve Bank of India. He said that the application has been developed for all the segments of the customer who can take benefit from this secured platform of banking transaction anywhere in the world and can transfer funds towards business at any bank in India. The e-portal will further help the employees to keep a watch on the working of the Bank and help check bank leakages as the e-portal has been developed using web centric secured and reliable technology. Managing Director, Himachal Pradesh State co-operative Bank, Gopal Sharma, said that the mobile application could be downloaded from the web-site of the bank or from Google play store. Chief Secretary P. Mitra, Additional Chief Secretary, V.C. Pharka and Narinder Chauhan, Director Information and Public Relations, Dr. M.P. Sood, Chief General Manager, NABARD, Dr. Radhakrishnan were also present on the occasion.